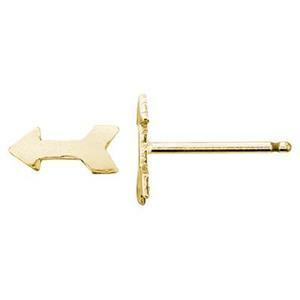 14/20 Gold-Filled 3.1x7mm 22 gauge Tiny Arrow Stud Earrings Post, .8mm Post Thickness. Clutches not included. 10 piece pack is the equivalent of 5 pairs. Hitting The Mark! It’s easy with our GF202R – 14/20 Yellow Gold-Filled 22 Gauge Tiny Arrow Stud Earring Post. A tiny bit of Boho fun! Take Aim with your Jewelry Designs and be Right on Target! Choose from our Gold-Filled Clutches to affix to your Posts.